Work for a show at Schaller Gallery just went out the door, so I’ve had a little time to do studio clean-up and some research. I had a piece that I’d surfaced at the ends, planning some decal shapes in the center, and a large serving tray that didn’t pass my inspection that I hoped I could make a bit more attractive with decal intervention and use around the house. There is a company that is developing non-toxic decals, some of which may be safe enough unfired for use by children. This would be a great boon for functional potters. Traditionally, many China paint and ceramic decal products are fluxed with lead. I have some samples of their sheets of solid decal color (not yet for sale), as well as some sheets of solid ceramic decal color from Chinese Clay Art (13″ x 20″, 8.00, probably NOT food safe). 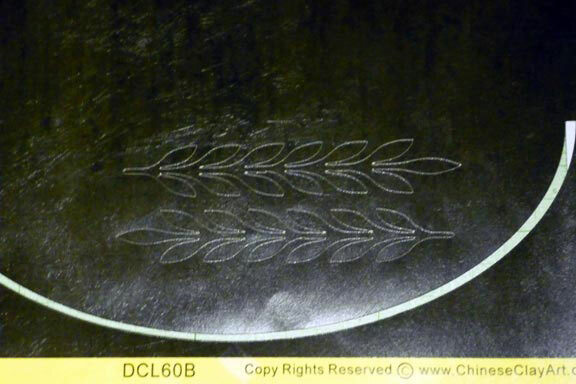 With Make-The-Cut software, I made an 11″ x 7″ oval, did a nested duplicate where I could set the width – the software will make and center a smaller duplicate of the shape – and made a band that would be the size of the bottom of my platter. I wanted a crisp, solid black line to anchor the bottom of the composition and make the wimpy, pale ground look like a contrast. Below left, the cut shape left on the sticky cutting mat that goes through the die cutter bed. Right, the sheet of decal medium that was peeled up to reveal the cut shape. Removing things other than the cut shape from the mat is called “weeding”. This was very simple, but if you do elaborate shapes with a lot of interior cut-outs, it can involve some time to weed all the negative spaces. Below, the arc applied to the platter. The arc was cut in several places so that it appears the leaves come in front of the arc. It would have been good to have a “before” image as well. The arc grounds things and makes a better value contrast with the light ground color. 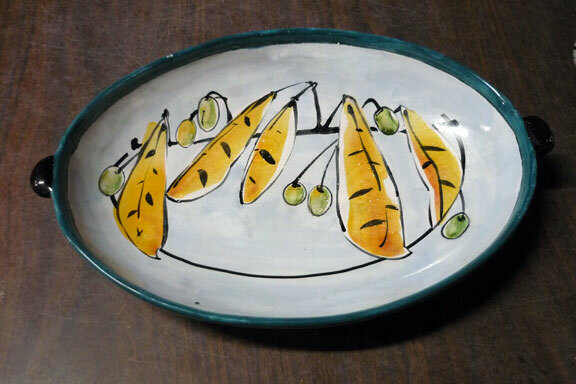 The decal color is probably not food safe, and would not be used in a situation where I would not control the platter’s use. Acid foods could cause lead to leach. This is a small shape, and the amount of lead would be small, but not a good practice. I will keep this, and NOT serve pasta with tomato sauce in it. The most important part of this exercise is the experiment with the die cutter and decal medium to see what’s possible. 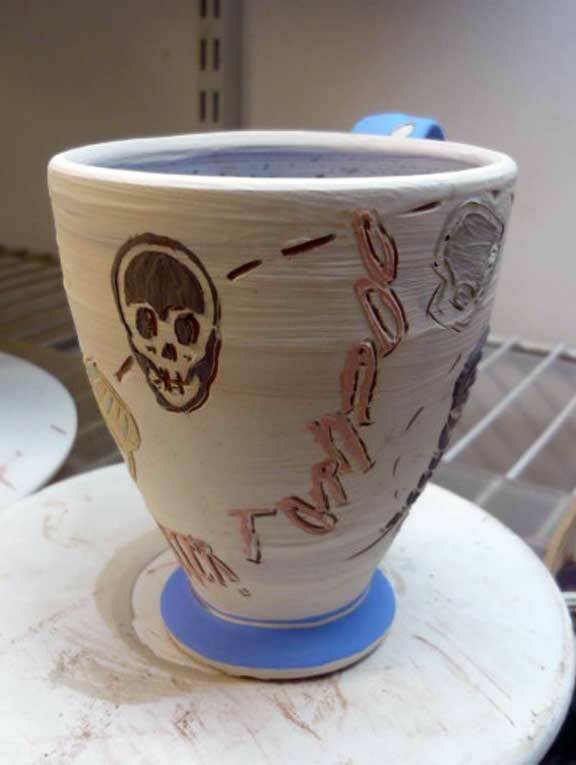 I recommend using potentially toxic decal media on the outside of functional pottery only. 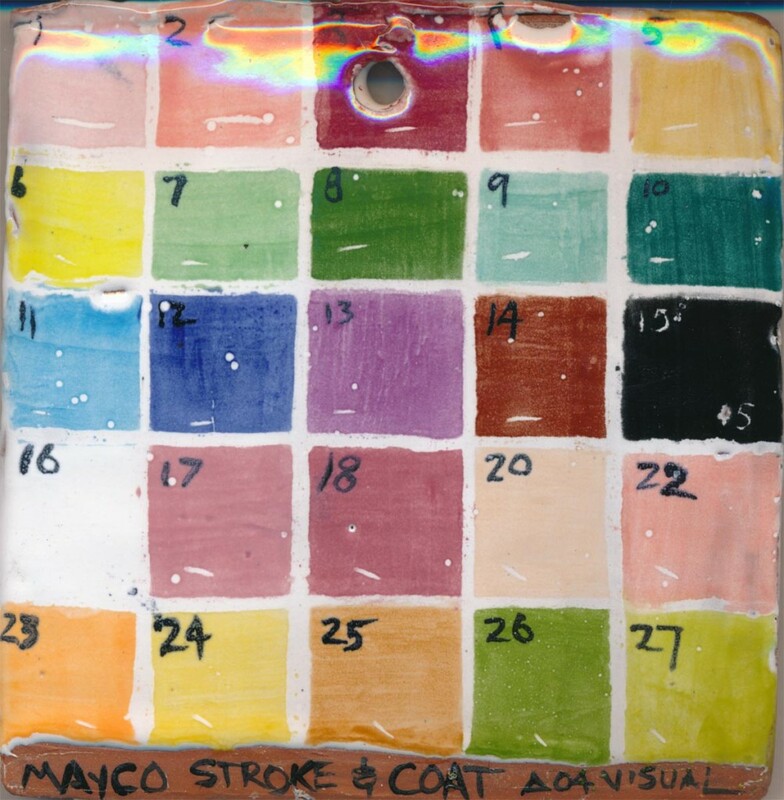 Majolica platter with unfired black arc decal shape. The green sample of the non-toxic decal medium cut poorly. The decal medium was stretchy and tore in cutting, and pulled off the backing easily. Not good for use with a die cutter at this point. 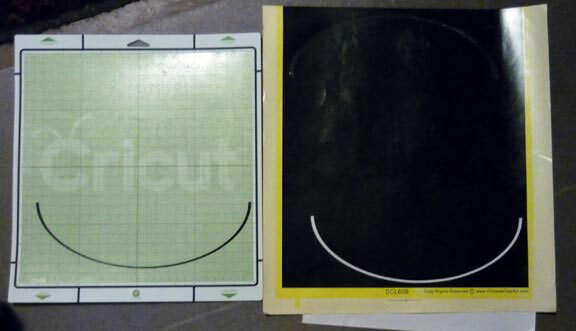 Settings for the cutter were the same for both decal sheets. Offset .35, force 110, speed 10/10, single pass. Experimental non-toxic decal medium. Tore badly in cutting. Die-cut shapes from Chinese Clay Art black solid decal sheet. Artifact arc from earlier cut. The test tray with shapes in both the green non-toxic sample decal medium, and the Chinese Clay Art black. Applying the cut decal forms is a new challenge. In using a traditional decal printed onto a clear base, a large, simple shape may be cut and applied because the clear ground medium will either burn away, or clear cover coat will melt into the surface. With intricate cuts, the decal loosens from the backing, and can easily fold over and stick to itself or wrinkle, making a poor application. I found I had to put the decal face-down on my hand, carefully peel up the backing, then coax it onto the ceramic surface from my hand by pressing it down. I’m still working of developing moves on this. The wet decal stretches a bit, so just sliding the backing out from under the leaf shapes made the backing catch on the lower forms and decals fold onto themselves. Ew. I also tried peeling back the first half inch of backing, putting the exposed decal onto the form, and then gently peeling back the backing in a U shape while lowering the rest of the exposed decal. These problems are much simpler with silk-screened decals than they are with complex cut shapes. 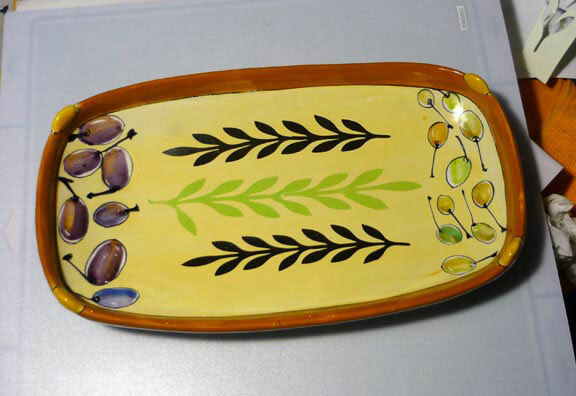 Majolica tray with painted image at the ends, unfired cut decal shapes in black and green in the center. Learning to use the die cutter is a lot of fun for me. Not sure where it goes in terms of my aesthetic, but it offers the opportunity to do things not easily done with majolica and a brush, like crisp, precise shapes, text, dense, solid color. Also good for touch-ups and revisions. Kiln is cooling. Looking forward to the results. Bottom line: new problems found. The specific decal medium makes a difference in how it cuts. Not all are equal for die-cutter use, although they may work well with scissors. The die cutter continues to intrigue me. I’m still working my way through some video tutorials and online info. The software does amazing things, but some days I have trouble figuring out what I don’t know to get where I want to go. I’ve been working on some cards in cardstock to learn the software – paper is cheaper than other materials, and there are bound to be failures while learning. The manual for the Zing die cutter says to experiment: you’re bound to have failures, but you will learn a lot. A good attitude. There is a great deal of info online, and I’m working on a handout for my web site to list some of those resources. In studio, I had cups. I wanted to do some sunflowers. Realism isn’t a big goal for me. Many of the plants I paint are made up, rather than descriptive of a specific plant or fruit – the generic idea of plants, leaves, flowers, fruit. But even within stylization, there are some shapes that are harder to make with a brush in one fluid stroke. With majolica, the overlaps often show. 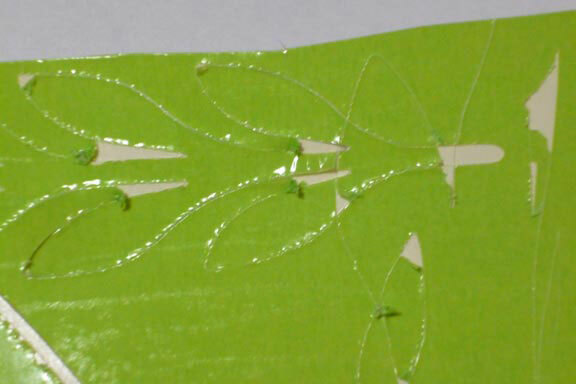 So, I made some Tyvek stencils of wide leaves with toothed edges. 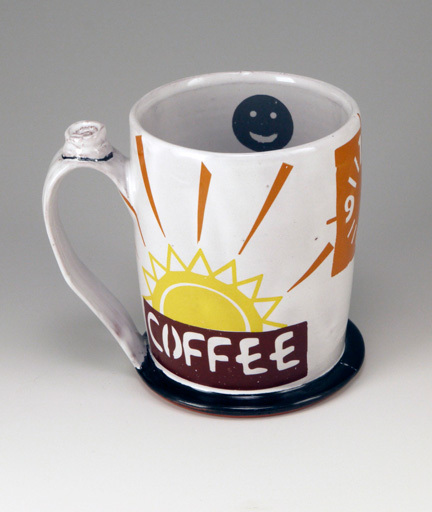 preferable with the cup on its side so the stencil sits with gravity helping. The results are not as crisp as a slip stencil, but it does help me get closer to that broad leaf shape with a toothed edge in one stroke with a big, soft brush. At NCECA, I will be the point person for an NCECA Connections group for die-cutter shop talk, Friday, 5 pm. Check the program or with the NCECA booth for location. 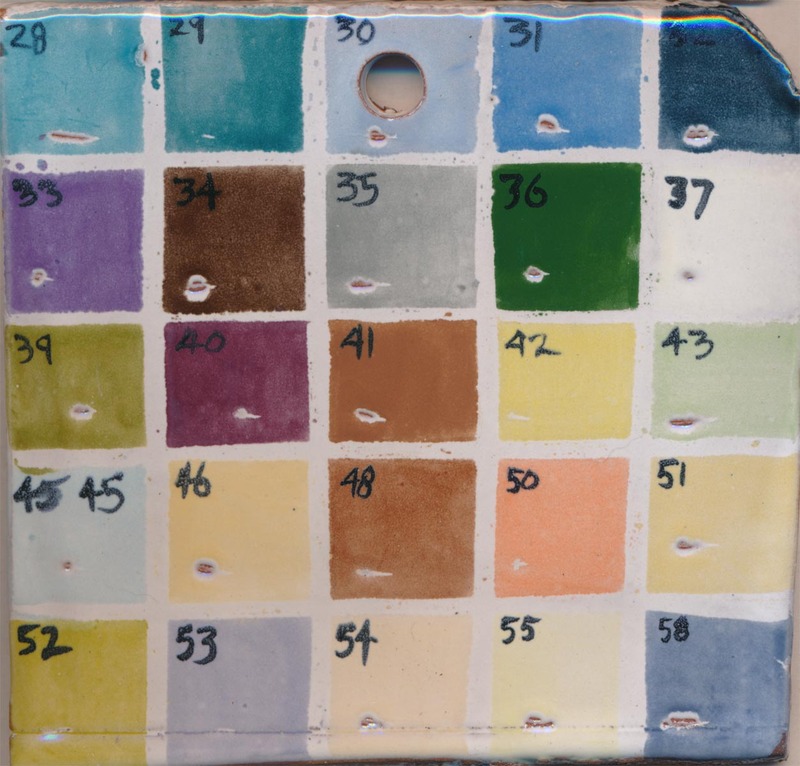 The Ceramic Art Cart/Keraflex people are testing some un-leaded sheets of solid decal color, and kindly provided samples sheets in a number of colors. Last night I jammed on it and did my first decal cuts on the die cutter, using their samples. Took some adjusting to get the right blade depth (check the sample cut on the decal medium itself, not just the backing), force (80), speed (6- which is s-l-o-w), and cut (2 passes). The first time with less force and one pass, didn’t cut through. Worked better with the settings listed, but this is a very slow cut. 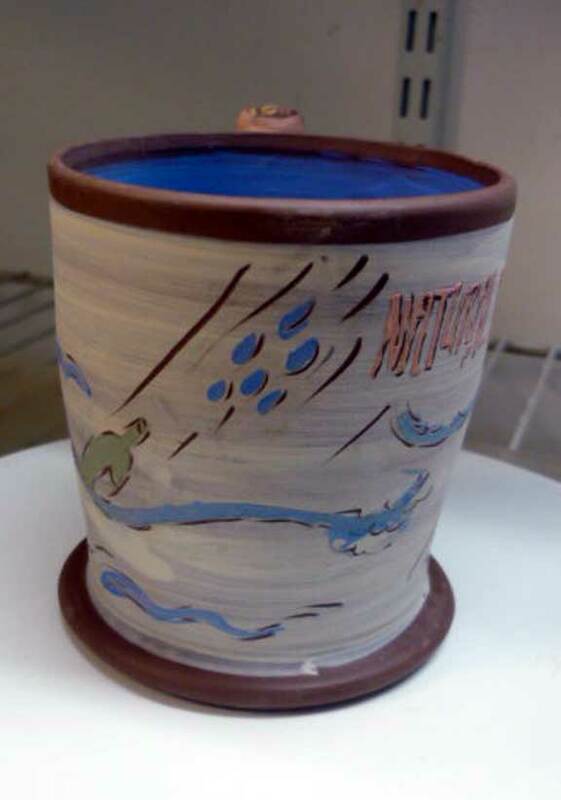 Decals were put in water, slid onto the cup once loosened from the backing, patted dry, and fired to 017 slow in my test kiln. Results below. This is how I would like to imagine I feel in the morning. I was thinking about getting up early and how some days coffee makes the sun rise. The brown decal sheet was the right coffee color. 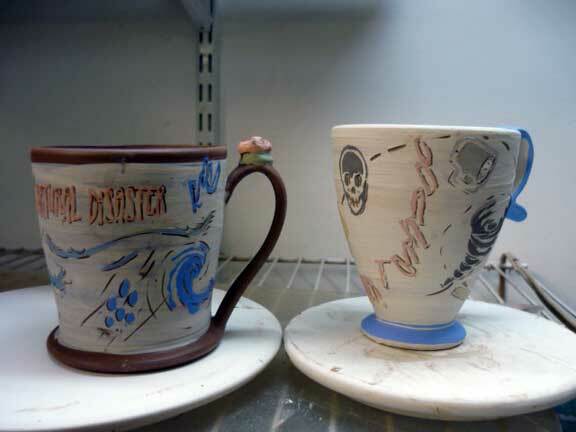 These were done on top of an already glaze-fired, plain white body majolica cup. Yellow, ochre, chocolate, and grey decal sheets used. If you’re at NCECA and want to talk shop about die cutters, come find the Connections group. 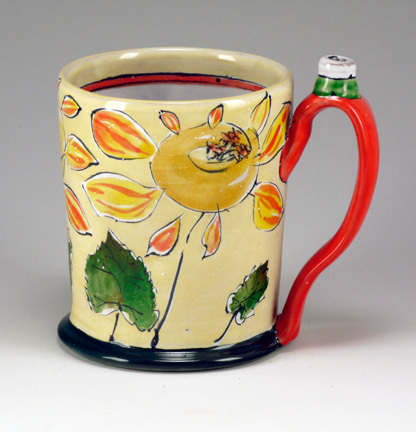 I’m off tomorrow to the American Pottery Festival at Northern Clay Center, Minneapolis. 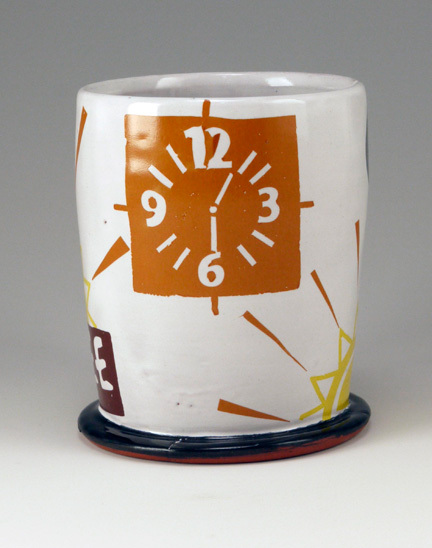 I’ll talk with MN potter Kip O’Krongley about her use of a die cutter for stencils on clay. 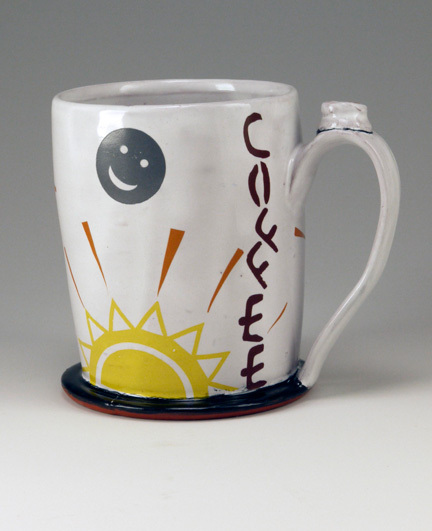 The clay people, shop talk, and good pottery at APF will be wonderful. My die cutter work slowedwhile I finished the APF works, photographed, inventoried, and shipped. The home page on my web site has links to the gallery of works for that and the upcoming Charlie Cummings Cup show. All majolica works. There’s info about my cheap-and-dirty photo setup used to take the images on the Handouts page of my web site. Natural Disaster: Fire. Die-cut slip stencils on earthenware. The Accugraphics (Klick-N-Kut) people were kind enough to furnish me with a Zing die-cutter for research and promotional consideration. They had not considered ceramics application for their product, and are curious. The Zing looks like a serious tool. It will cut 14″ wide, and accepts media a bit wider than that. The Silhouette Portrait I wrote about earlier cuts 8″ wide maximum. The Zing has several kinds of registration: you can cut in relation to your image and position the knife starting point manually, you can use a What-You-See-Is-What-You-Get (WYSIWYG), or use the laser beam to register the lower right corner. 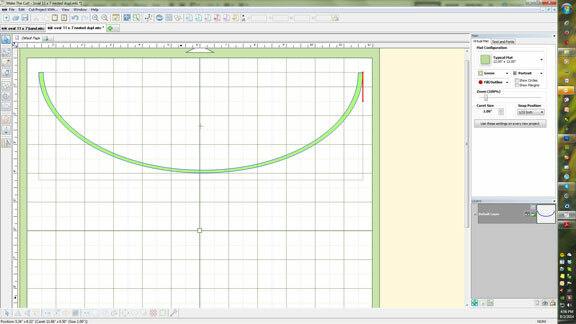 The Zing works from the Make-the-Cut software bundled with it, and is controlled from that software on your computer (Mac or PC). My office at home is small, and I am a tool, supply, and books packrat. I have sewing, beading, and knitting supplies, 2 remaining cabinets of slides I’ll either scan or eventually ditch, and loads of books on art, design, ceramics, and computer topics. I also have a scanner, a laser printer (for b & w printing that won’t smear if wet, and laser decals – info on my website handouts page ), and an inkjet printer. The Zing has to be attached to your computer, and you want to be able to see it from your computer screen for moving the registration to the right place before cutting. This meant moving the inkjet to the other side of the room, and making a Wi-Fi connection with it. I had to give up the fax connection to do this. Like the Portrait, the media moves through the Zing, and you need a modest space in front and in back of the cutter. Unlike the Portrait, the Zing people have done a very thorough manual that’s downloaded or viewed online, and loads of videos about details you need to know on YouTube. They do a good job on educating their users. The Zing comes with a sticky cutting mat, a 45-degree (regular) blade, a 60-degree blade for thick things, a blade holder, a pen (you can also clamp your own pen into the holder) and fillers for the pen. The instructions walk you through set-up, and coach you on practicing with the pen to become familiar with how the cutting set-ups in the software actually locate on the die-cutter, the adjustments, and other details. They kindly say that you have of make a lot of mistakes to learn, you won’t hurt the cutter, and to get in there and TRY a lot of things. The Zing intro online videos are succinct and helpful. You can cut everything from cardstock and vinyl to cake icing sheets, to balsa wood and felt. Someone even mentioned cutting flattened soft drink cans. You can also engrave and emboss, with the associated tools. I spent much of the day making space for the Zing and setting it up, so I’ve barely scratched the surface with a few pen drawings of arrows to see what they’re telling me about how the various settings deal with where they work on the cutter field. It will take a bit of doing to get past the tech parts, and a bit more to decide how my aesthetic works with this tool, but I’m very intrigued, and glad I have the opportunity to work with the tools. I assume for decal solid color sheets I’ll want to put it on a mat and cut all the way through the color and backing. The video helped me see how I might figure out the right knife depth for that, as it’s thicker than paper, and maybe thicker than cardstock. The Portrait has a ratcheting adjustment for blade depth, while the Zing is infinite, allowing for finer gradations of setting. For something like cutting vinyl, you’d cut through the vinyl, but not the backing – that’s a fine adjustment! You make adjustments depending on what media you’re cutting to adjust blade depth, speed of cutting, and force. The blade depth is manually controlled, the speed and force set through the software. If you’re curious about this technology (or just want to see how it works with a cake icing sheet! ), do check out some of the videos on YouTube. Working with a die-cutter is fascinating for me, but there is a learning curve to climb about the usual ceramic materials and design issues, and then the cutter you use, the material you choose to cut, and the design you want to cut out in relation to how the die-cutter works, the programs to create vector images and/or scan art, and how you plan to use the resulting image. My initial thought was to cut paper for slip stencils on leather-hard clay. I’ve used newspaper for this often when cutting out shapes with scissors or an Exacto knife. 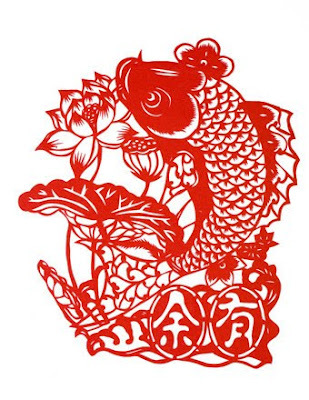 If you want to be REALLY inspired about what you can do with simple tools in stencil-making, check out Chinese paper cuts. The die-cutters use a plastic mat with an adhesive surface on the top to hold your media (paper, vinyl, cardstock, etc.) stable while the cutting happens. Copy paper sticks well to this. It cut with a few tears at the corners, although the blade was new. Might need to cut slower. There are a lot of solutions on the Make-the-Cut forum, which looks like a good place for die-cutter problem-solving. The mat moves through the machine and out the back in a straight path. The next issue: you have to peel the paper off the adhesive mat. This causes thin paper to curl up. You can flatten out in a file folder and put a book on top to see if it will flatten out. Cardstock is a bit thicker and won’t conform to a curved surface as well as thin paper, but it’s much easier to cut and much, much easier to peel off. There are a lot of other media to try: plastics, Tyvek, vinyl, etc. I have a roll of Tyvek on order from Material Concepts. Their excess inventory offerings are a better price than the regular stuck. Tyvek is a re-usable, tear-resistant material you’ve probably seen as white mailing envelopes, and is fairly flexible. I hear with a die-cutter, Tyvek is best cut with a fabric blade. I’ve also read that the fabric blade isn’t different than the regular blade, just stays sharper if used ONLY for fabric, which helps it cut better. Cutting paper dulls the blade over time. 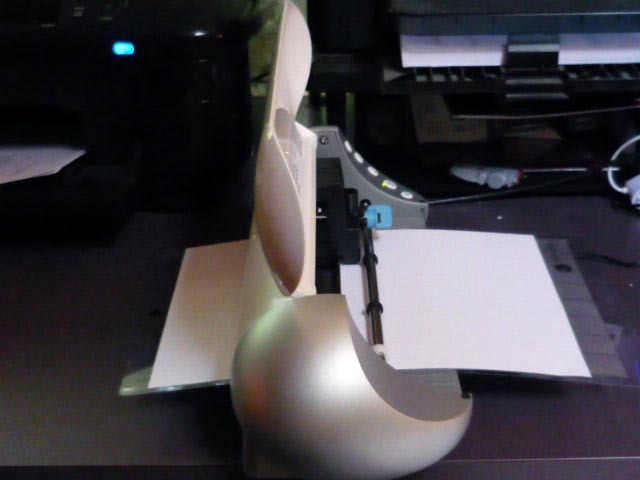 The cutter does things that may be hard to do by hand, and will cheerfully duplicate whatever file you have to cut. The place where is ceases to be wonderfully time-saving is when you have to “weed” your cut – i.e. peel off the ground and then the images cut from the adhesive mat. 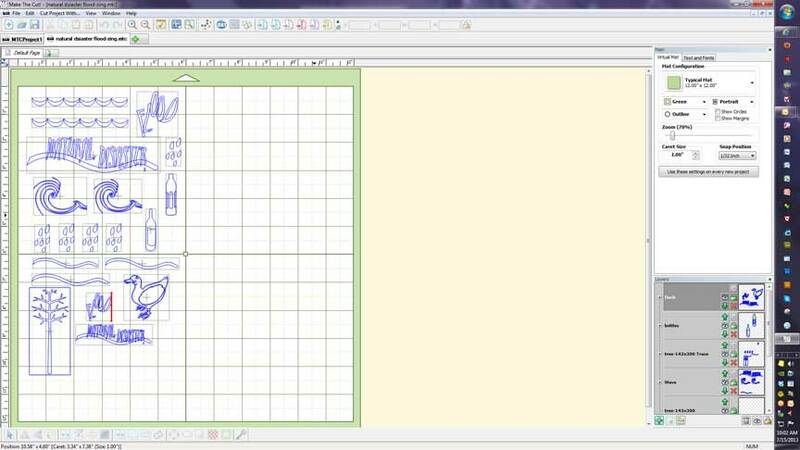 Depending on how intricate your cuts are, this can be rather fiddly and time-consuming. I just bought some transparent plastic file folders to store my cuts in so they’ll be flat and I can find them. Although I plan to do stencils for slip on leatherhard clay, I didn’t have any of that going on in my studio right now. Trying to finish up some majolica work. So, I cut my stencils from cardstock into individual words, and held it down letter-by-letter to use as a stencil for a specific font and majolica decorating color applied with a brush. Not really precise, but this is all research. Pictures of this work next time. The Silhouette Starter Kit for Vinyl is not worth buying. You do get black, white, green, and pink vinyl (9″ x 24″) and transfer paper, a hook tool to help weeding cuts. All useful. The idea/instruction book is very small, very limited, and ditto the “instructional” DVD. In my opinion, both worthless. 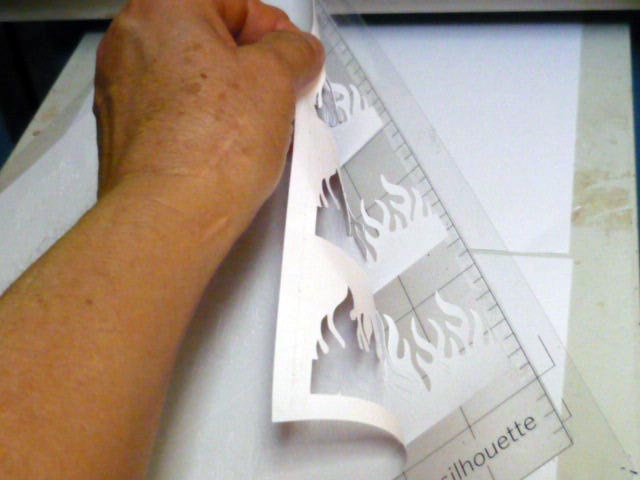 One quick video of cutting, weeding, and using transfer paper to move a design. No talk. No other ideas or discussion of any problems or methods. The Silhouette “scraper” could be easily replaced by a retired Starbucks or credit card. You do get a pink patterned cardboard box in which to store your supplies. Skip the starter kit and just buy the Silhouette vinyl online – I’ve seen it on sale – if you want it. As a teacher, my perspective is that the Silhouette people do a poor job of education on their product. 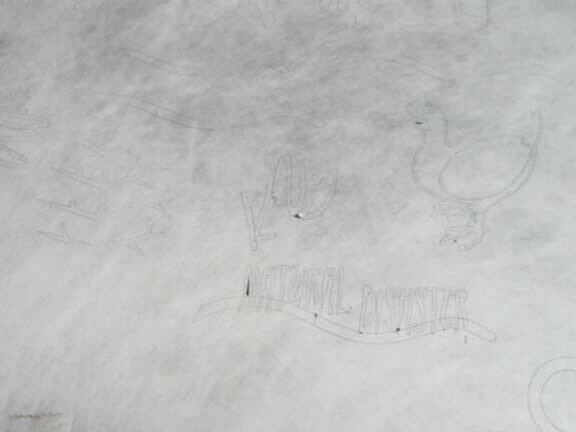 Image below of the ground paper peeled off the mat, and the resulting shapes left on the mat. Both with be useful with slip – the outline as a stencil to paint in, and the shapes as friskette to reserve the ground color. Die-cut cardstock with the ground peeled off and the shapes left on the adhesive mat. I’m back from a month at the Archie Bray Foundation, where I did a month’s residency in studio, and presented a 3-day workshop. Great people in the workshop and at the Bray. Thanks for the good time and inspiration. work in print, but it was more revealing to see him in studio. He’s using a Silhouette SD die-cutter to cut out adhesive paper resist shapes, and to cut out shapes from printed laser decal sheets to match his glazed or resisted areas. While I’ve known that the scrapbooking world had such devices, the light bulb didn’t really go on until I looked up the die cutters. Early models required cartridges from the manufacturers and only cut those shapes. Things got more sophisticated, and Silhouette America made a cutter that connects to your computer and will cut from .svg files: you can make your own or buy from Silhouette. The graphics are vector-based, like those created in Adobe Illustrator. A post on Facebook about my interest in this technology yielded a kind note from Brenda Moore, former workshop participant, who mentioned that she’d taken a workshop at Sawtooth from Doris Petersham who included this technology. A note to Doris to ask if she had any pointers for info led to her suggestion of Make the Cut software as the most flexible tool to use with a die-cutter. The have a hardware connection with the Zing die-cutter. I bought the cheapest Silhouette – the Silhouette Portrait. It has optical registration, is similar to their CAMEO but smaller – 8″ cutting width. It just arrived yesterday, and I’m working on setting it up. 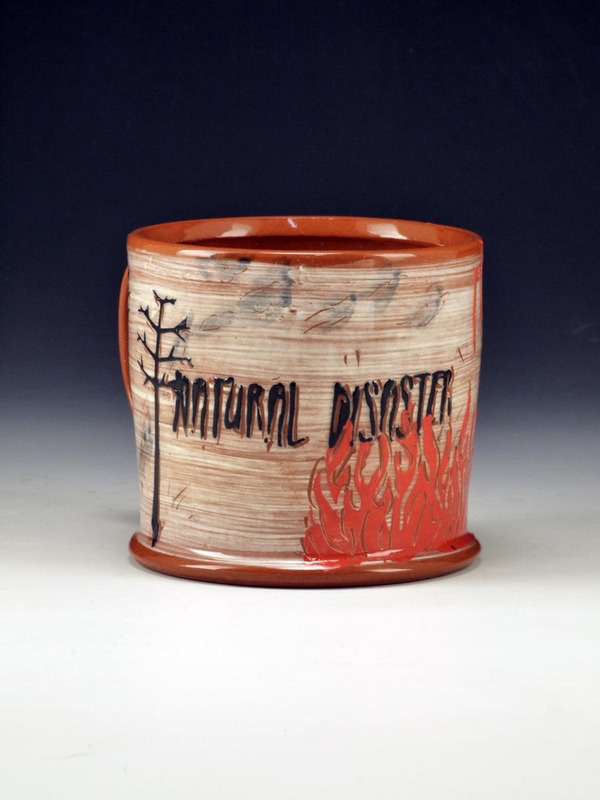 This really all was instigated by ceramic artist and educator Martina Lantin asking me to do the next Crimson Laurel Gallery themed cup show, Natural Disaster. 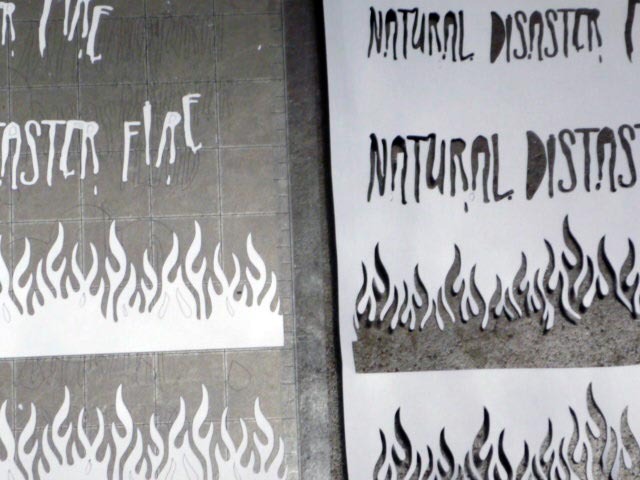 I wanted to use symbols and icons to represent natural disaster suggestions, either in slip or decal color shapes. Once I discovered Make the Cut and the Zing, thanks to Doris’s kind help, I wanted one of those. One is on the way. The Zing will do 14″ wide cuts, online reviews say it’s better for thick or tough materials (e.g. Tyvek for re-usable stencils), and has laser registration, which should be more accurate. Make the Cut works with many die-cutters and offers a lot of tutorials and free Webinars on Tuesday nights. The Zing people are kindly facilitating my research, and I hope to see my new Zing soon. I’ll post more info here on the blog as I learn, and will eventually work on an article and a handout for my web site. Lenzig produces color products and has free trend forecasts. People in various industries often pay to subscribe to trend forecasts to help predict trends in style and color when developing products for upcoming seasons. You’ve all gone shopping and seen echoes of the same color palette in a variety of products and stores – they all picked up on trends. Here are Lenzig forecasts for Fall/Winter 2014/2015 – they DO plan that far in advance – thanks to my sister, Robin Wagner, a clothing designer and educator in Los Angeles. While I can’t say I follow color trends overtly, I LOVE to read the color stories they write that reflect an emotional tone and explain the color choices. Often, they’re a bit overblown, but fun, and it helps me to think about color cause and effect in my work. Often trends reflect social and cultural patterns. E.g. after the financial melt-down, people wanted to feel calm and secure, and maybe rich with things they already had. Emphasis was on nesting, rather than going outward because people spending more time at home. 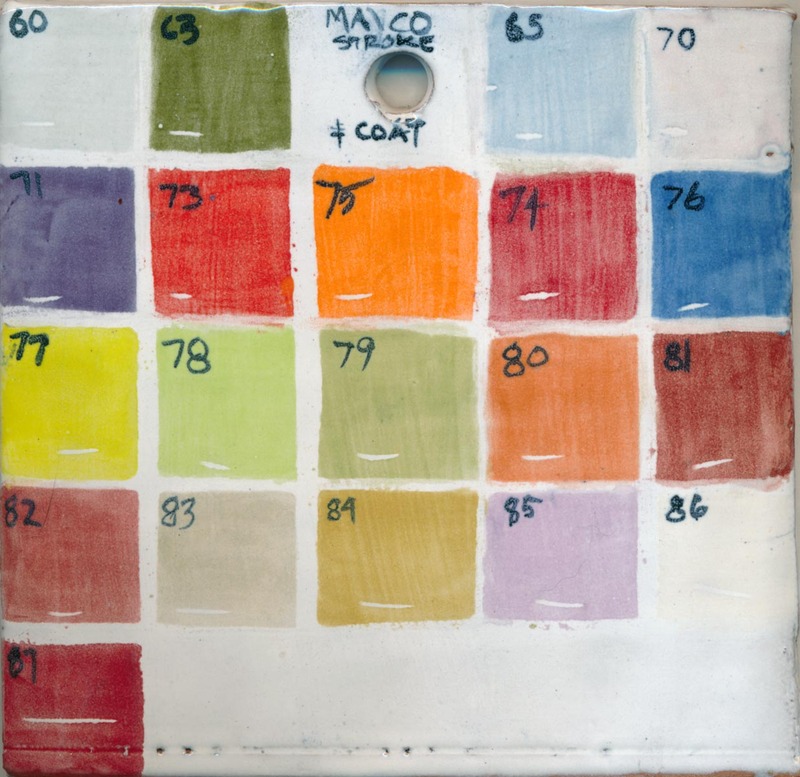 Color stories for that time reflected those moods, and made them an asset. 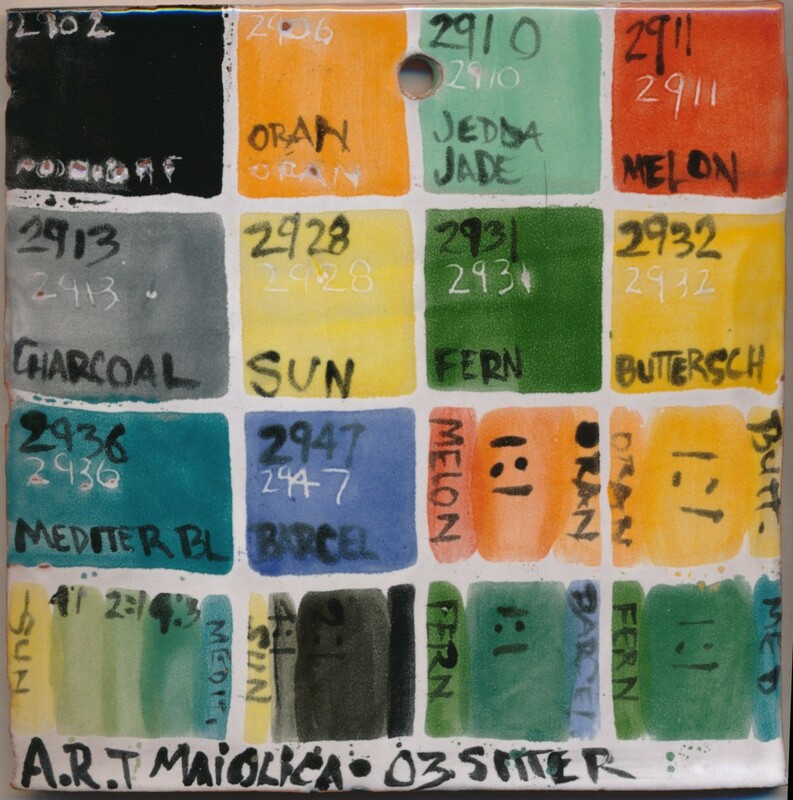 One of Lenzig’s palettes for the upcoming seasons.